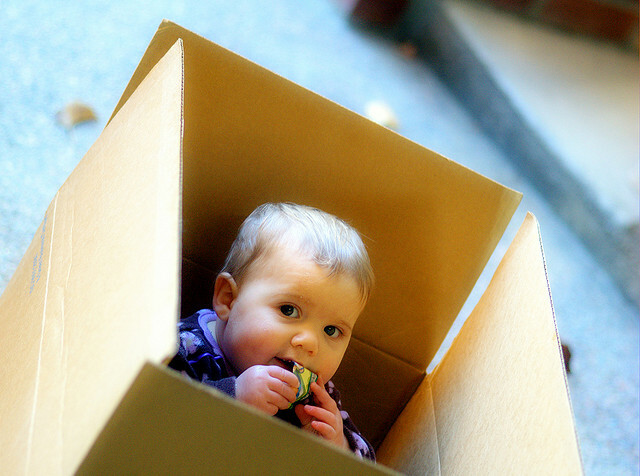 If you think moving house is stressful for you, imagine what it’s doing to your kids. For most young children, a move can be a big, scary monster under the bed. But by employing some sound tactics, you can turn it into a big adventure. Kids pick up on your mood and will reflect your emotions very quickly. Sadly not every move is made under the best circumstances, and if you’ve been forced to move as a result of a death or divorce, try to keep things upbeat when your children are around. Even though they’re already unsettled and insecure, children don’t like sugar-coating, so answer all their questions clearly, but gently. Even if the opposite case is true, and you’re moving to a bigger house or for a new job, your children may still become anxious about leaving the home they’ve probably known their whole life. Reassure them that your pets will be coming too. That their friends can still come to play. Here’s a few ideas to smooth the way before you move. Use maps and pictures to show young children where the new house is in relation to your old house. Point out child-friendly attractions nearby. There are host of children’s books and DVD on moving house out there. Buy a few for bedtime stories. One of the all-time classics is The Berenstain Bears’ Moving Day. Take them to see the new house, and show them their bedroom. If you’re planning to redecorate their room, create a mood board and let them contribute. Let them take photos or video on your mobile and create an album. If your child’s old room had wallpaper, cut out a square and frame it for their new room, so they’ve got something on the wall that’s familiar. Draw up a calendar with moving day highlighted. Think along the lines of an Advent calendar, where you could include small treats for every day leading up to the move. Older children in particular can have fun while you’re packing. Let them pack a few boxes of their things themselves. Give them colourful markers and stickers to label the boxes. When younger children see you putting their toys in boxes, explain to them that you are not throwing them away, and that the toys will be going along to the new house. But at the same time, a move is an excellent opportunity to declutter the toy box. Children have the incredible ability of accumulating masses of toys. So encourage them to create a box of toys they no longer play with to give to boys and girls who aren’t as lucky as they are. In an ideal world, arrange a playdate with grandparents, aunts or uncles or close friends on the day of the move. However, this is not always possible. So if you have to look after them on moving day, explain to young children exactly what is happening and what to expect on moving day. Remember what they will see is a lot of strangers trooping in and out of their house, carrying away everything they are familiar with. Give your kids specific jobs to keep them from getting under foot. This can include checking cupboards for anything that was missed or keeping an eye on your pets. Try to keep to their routine as much as possible such as regular meal times and naps. If you have a portable DVD player, a good selection of movies will keep them occupied for hours. Removal teams would normally will be with you between 7 and 7.30am and would crack on with loading up the truck if you need to do a school drop off. If you have regular family activity of movie or pizza night, try to stick to these traditions even in the midst of the move. It’ll give kids a sense of routine and familiarity. Once you’ve moved into your new house, stick to regular bedtimes and other activities so that your child has a sense of continuity and structure in their day. Let them unpack and arrange their rooms themselves. Take family walks around the neighbourhood, not only will it give you an opportunity to meet your neighbours, but allow your children to familiarise themselves with where your house is in relation to other landmarks in the area. Make a day of it and arrange family outings to local attractions. Have picnics in parks or take bike rides to nearby nature spots. If your children are school-going age and changing schools, try to arrange a visit to meet some of their classmates before starting school..
Keep reinforcing the good things about the new house, new school and new neighbourhood. It takes time for anyone to adjust to new surroundings, and for children (particularly younger ones) it can be even more overwhelming, so expect the odd tantrum, sulk or argument until they settle in. But if you’ve made them part of the whole moving experience, this should only be a temporary situation. So make the move fun! Image courtesy of David Goehring,Flickr,CC BY-NC-ND 2.0.